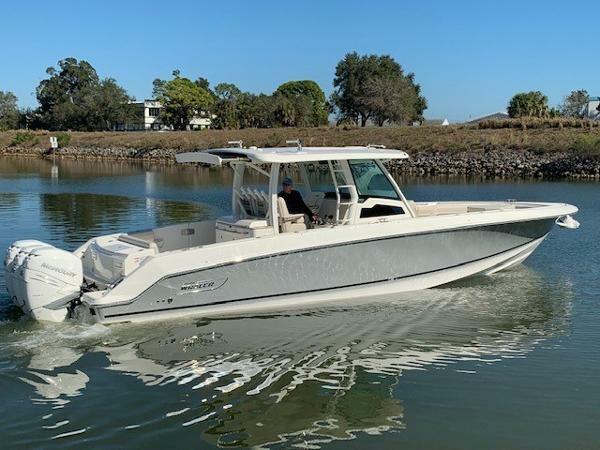 The 380 Outrage delivers a full-spectrum, pinnacle experience, performing beautifully as an offshore fishing platform, an entertaining vessel, a yacht tender or all of the above. 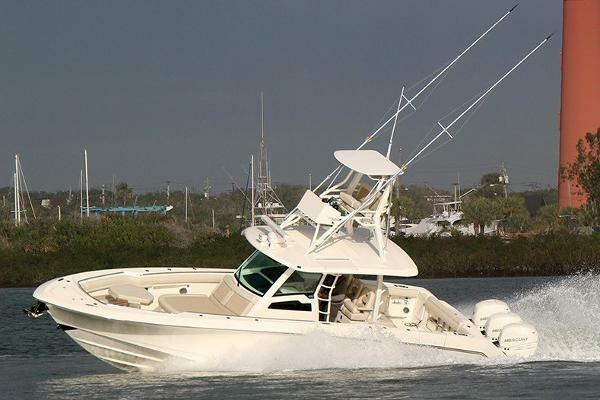 The roomy, notched bow features expansive seating and storage, while the cockpit includes a new aft-facing couch with optional removable table and an optional Summer Kitchen, perfect for entertaining friends and family. 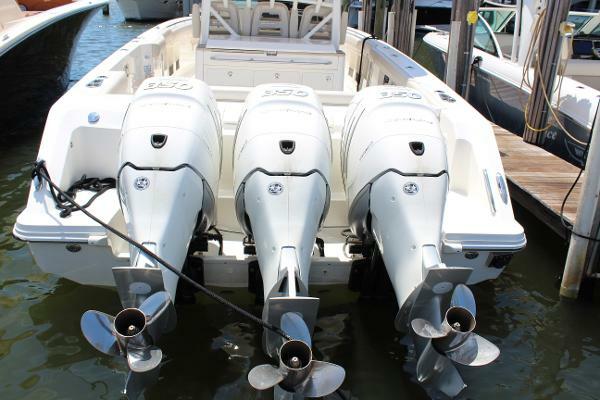 Boston Whaler’s precision-engineered hull and triple Mercury Verado engines work together to provide remarkable efficiency, reliability and smooth, predictable handling. 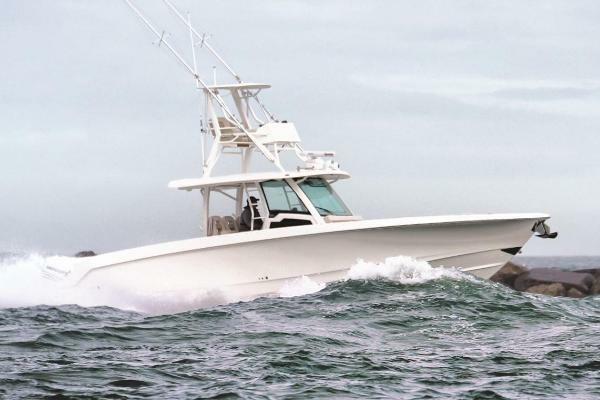 •Optional Whaler Watch technology provides remote connectivity by monitoring systems and vessel position via satellite, ensuring 24/7 security even while away. •Choose optional Joystick Piloting for effortless docking and seamless command. 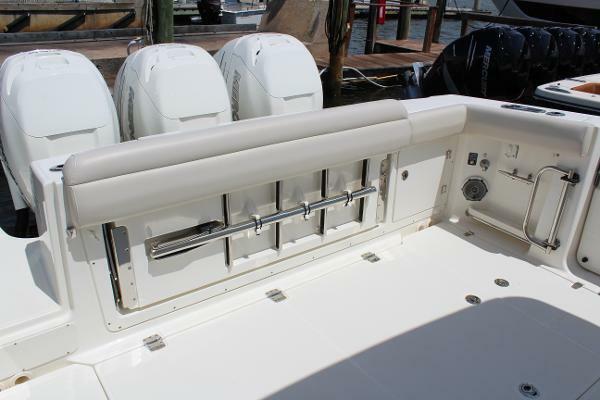 •Amenities for serious fishing include a 60-gallon transom livewell, a converting leaning post and ample strategically placed rod holders. •Cavernous “garage” storage beneath the bow lounge accommodates dive tanks, life jackets and more. 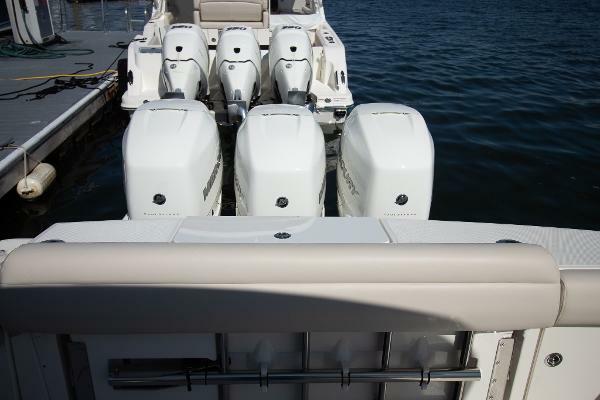 •Air-conditioned helm deck boasts seating for the captain and two companions with bolsters and fold-down arm rests. •Fully integrated hardtop offers protection from the elements. •Dual widescreen helm displays feature state-of-the-art Raymarine® navigational technology and offer full control of the stereo as well as the Mercury propulsion system. •Spacious air-conditioned cabin features a fully enclosed head for added comfort and privacy. •Deluxe Leaning Post provides a second livewell for serious sportfishing, or choose the optional Summer Kitchen to gain a grill. •Available with Seakeeper gyro-stabilizing system. 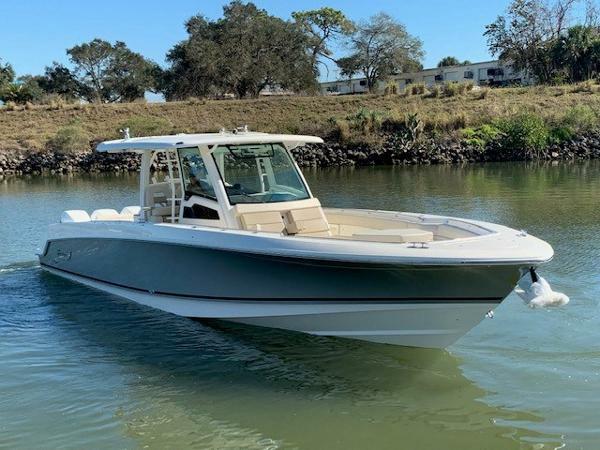 2019 Boston Whaler 380 Outrage The 380 Outrage delivers a full-spectrum, pinnacle experience, performing beautifully as an offshore fishing platform, an entertaining vessel, a yacht tender or all of the above. 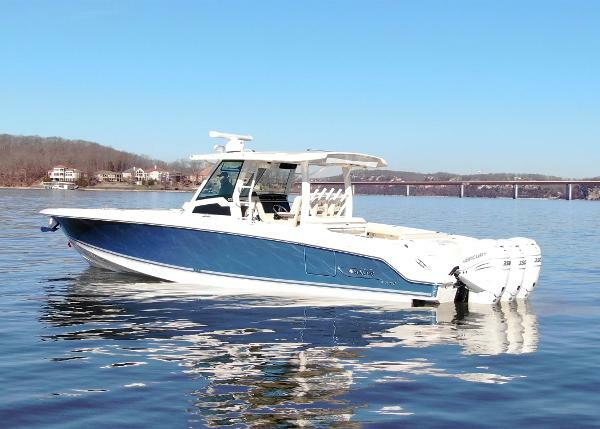 The roomy, notched bow features expansive seating and storage, while the cockpit includes a new aft-facing couch with optional removable table and an optional Summer Kitchen, perfect for entertaining friends and family. 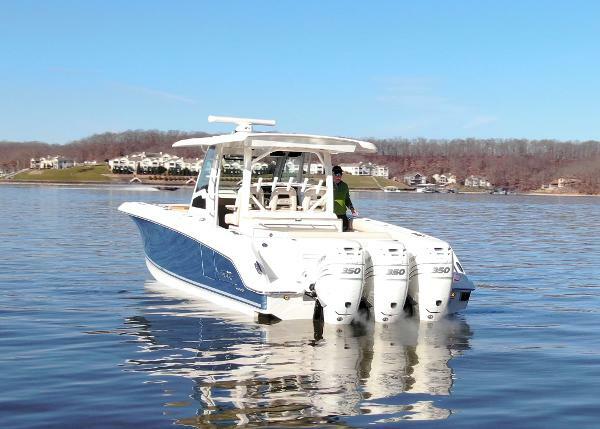 Boston Whaler’s precision-engineered hull and triple Mercury Verado engines work together to provide remarkable efficiency, reliability and smooth, predictable handling. 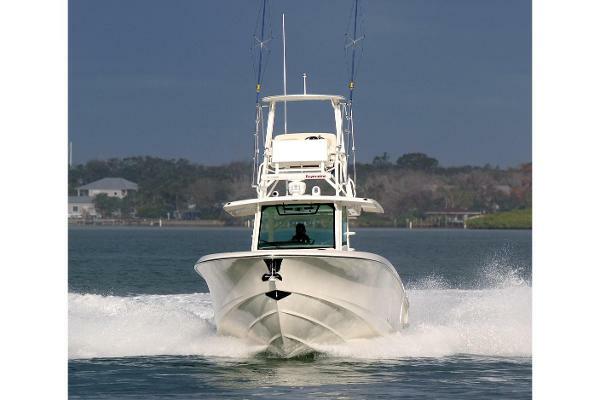 •Optional Whaler Watch technology provides remote connectivity by monitoring systems and vessel position via satellite, ensuring 24/7 security even while away. •Choose optional Joystick Piloting for effortless docking and seamless command. 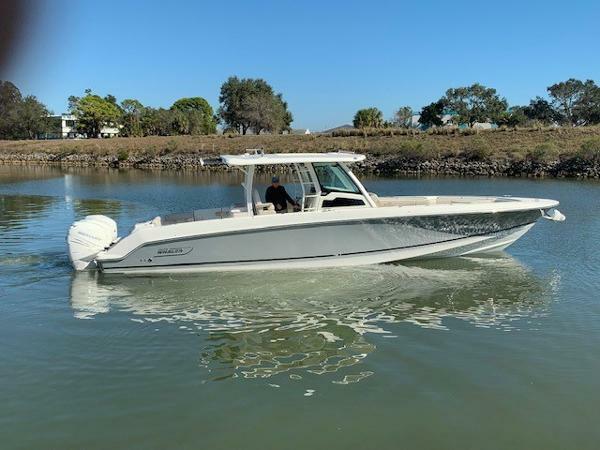 •Amenities for serious fishing include a 60-gallon transom livewell, a converting leaning post and ample strategically placed rod holders. •Cavernous “garage” storage beneath the bow lounge accommodates dive tanks, life jackets and more. 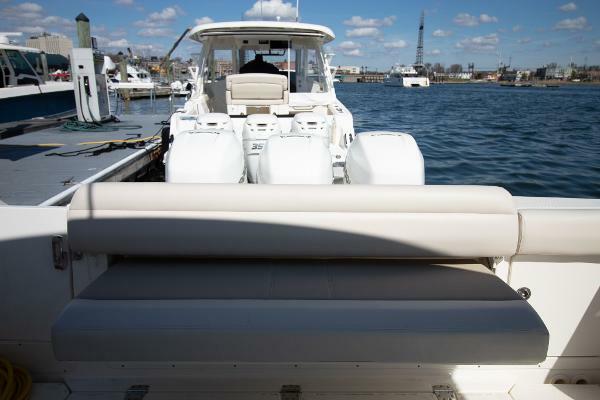 •Air-conditioned helm deck boasts seating for the captain and two companions with bolsters and fold-down arm rests. •Fully integrated hardtop offers protection from the elements. •Dual widescreen helm displays feature state-of-the-art Raymarine® navigational technology and offer full control of the stereo as well as the Mercury propulsion system. •Spacious air-conditioned cabin features a fully enclosed head for added comfort and privacy. 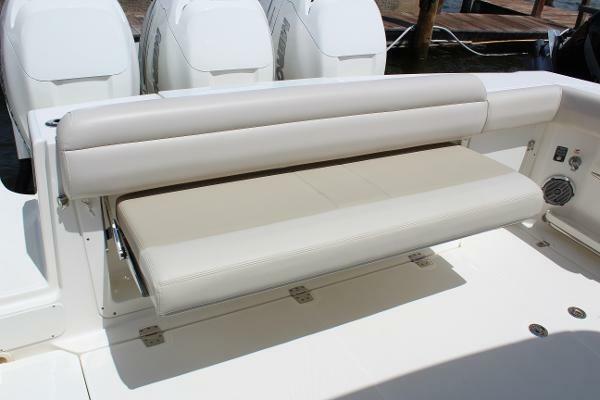 •Deluxe Leaning Post provides a second livewell for serious sportfishing, or choose the optional Summer Kitchen to gain a grill. 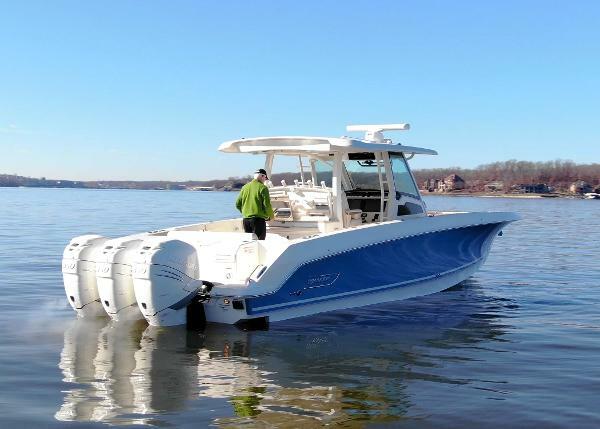 •Available with Seakeeper gyro-stabilizing system.